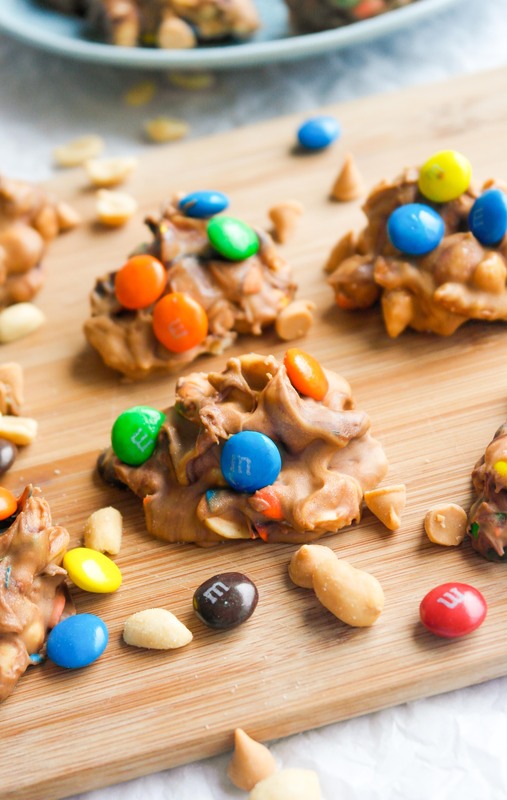 These no bake clusters are full of butterscotch and peanut butter (the world’s most irresistible combo) and are stuffed full of pretzels, M&Ms and peanuts! That being said, I haven’t had the chance to bake for a while. Thankfully, I think I have ESP because the week before I left for New York, I went into an absolute and inexplicable baking frenzy. I was all over the map, baking everything and anything. Boy, am I thankful for that because I have tons of wonderful recipes waiting for everyone. Including this one! This was another situation in which I laid out the ingredients I had in my kitchen and pondered what I could make. I had a bag of pretzels, a thing of peanuts, a wide array of chips (butterscotch, semi-sweet, etc. ), some peanut butter and powdered sugar. I scratched my chin for a moment and then realized what I could make. 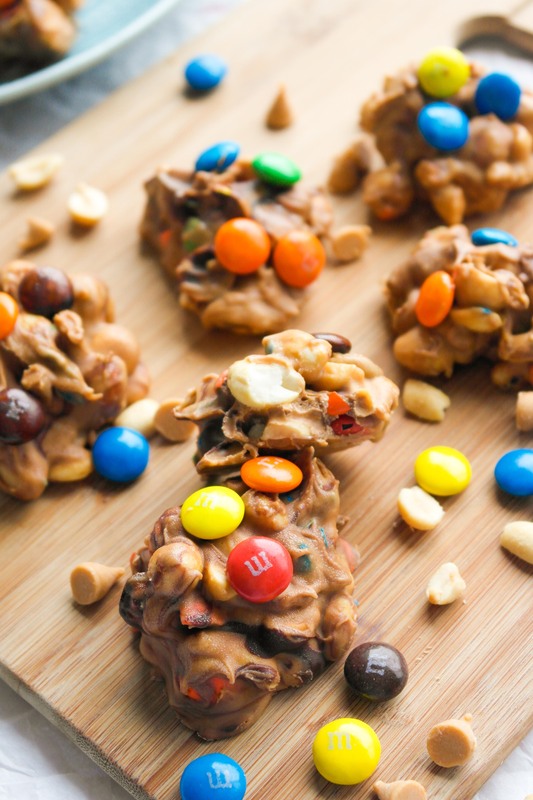 No bake clusters! I’d heard through the rumor mill that peanut butter and butterscotch are pretty much a dynamite pair, so that would be my focus. So I set to it, melting and stirring and adding and tasting. 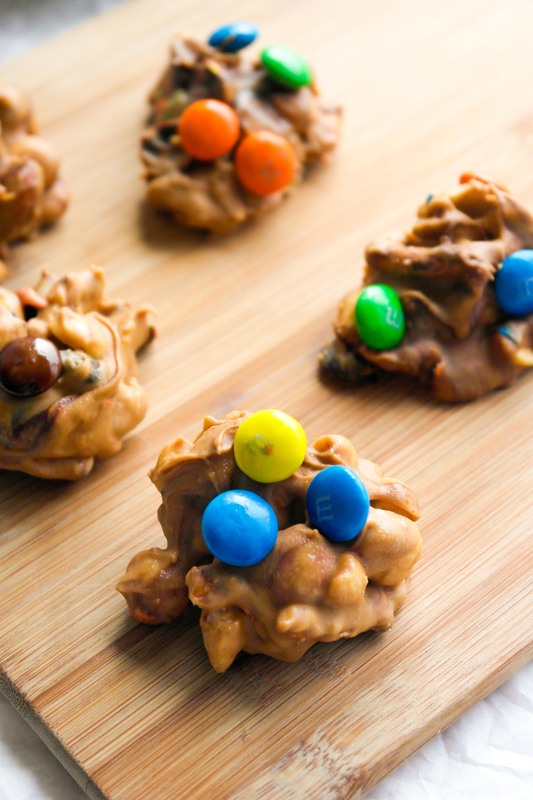 Whoever said that peanut butter and butterscotch are one of the best pairings ever was absolutely right. And these clusters prove it. But no bake cookies can go terribly wrong, as I’ve learned in my short life. I’ve pulled more seized chocolate chips out of the microwave than I can count. What happens when chocolate seizes is that it gets too hot and it all sort of just dies. One time, I turned white chocolate chips into smoking, charred, not-so-white chocolate chips. Oops. Mom was not happy with me. How can you prevent this? Well, I’ll tell you. Melt the chocolate in a glass container in the microwave. 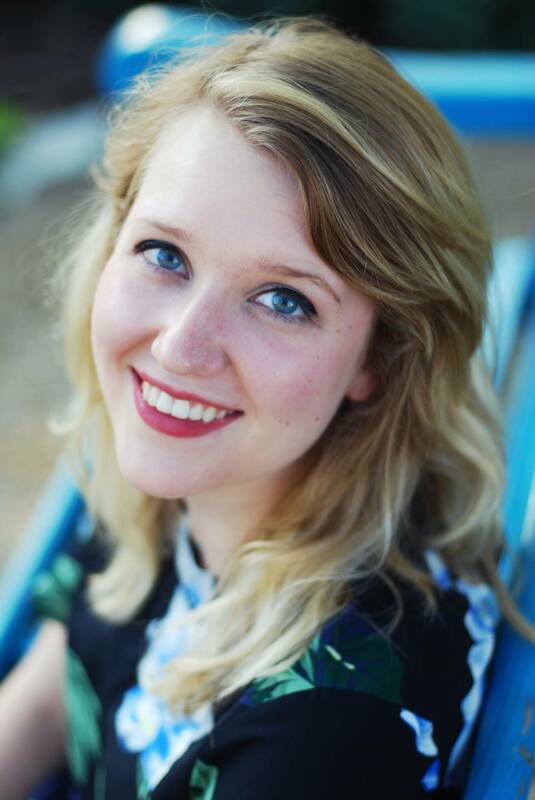 (I’ve had…interesting…experiences on stove tops.) Microwave the chips for intervals of THIRTY SECONDS. Every thirty seconds, no matter how unmelted they look, take them out of the microwave and stir. They will start melting if you stir by hand. Repeat until it’s nice, flowing chocolate lava deliciousness. If you can achieve that, these cookies are almost completed! 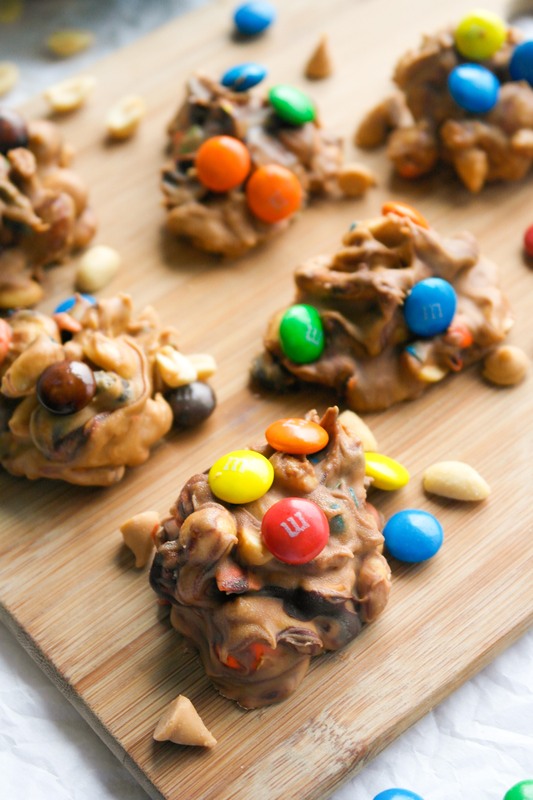 Finally, the beauty of these no bake cookies is that they’re completely customizable. You can use any kind of nut butter you want, any kind of chip you want, any kind of filling you’d like, really! So it’s all fun and games, but my recipe really is quite delicious! 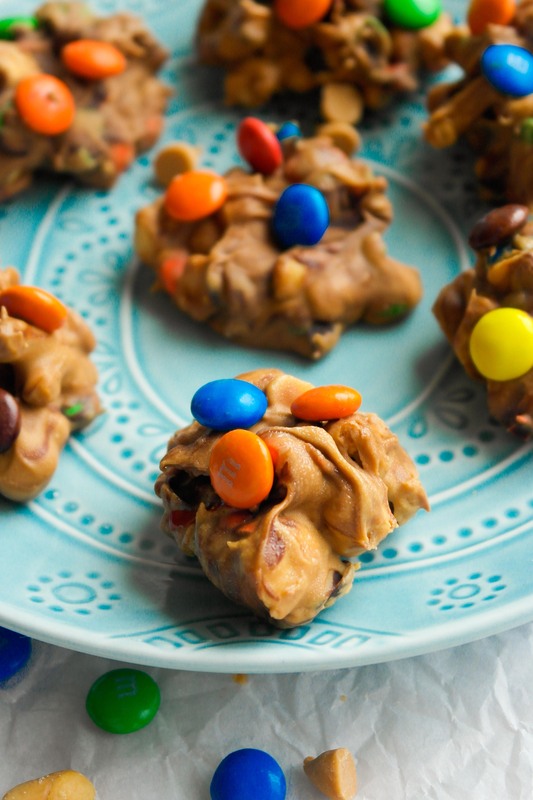 These clusters are quick and easy to throw together, and absolutely delicious! Line a sheet with aluminum foil or parchment paper. Prepare your mix ins. Measure out the pretzels and then break them into smaller pieces with your hands. Then measure out the peanuts and the M&Ms and add them to the pretzels. Next, melt your melty ingredients. Melt the butterscotch chips in the microwave in a glass bowl. Microwave them for no more than thirty seconds at a time, remove them from the microwave, then stir. Repeat this process until they have a flowing consistency. 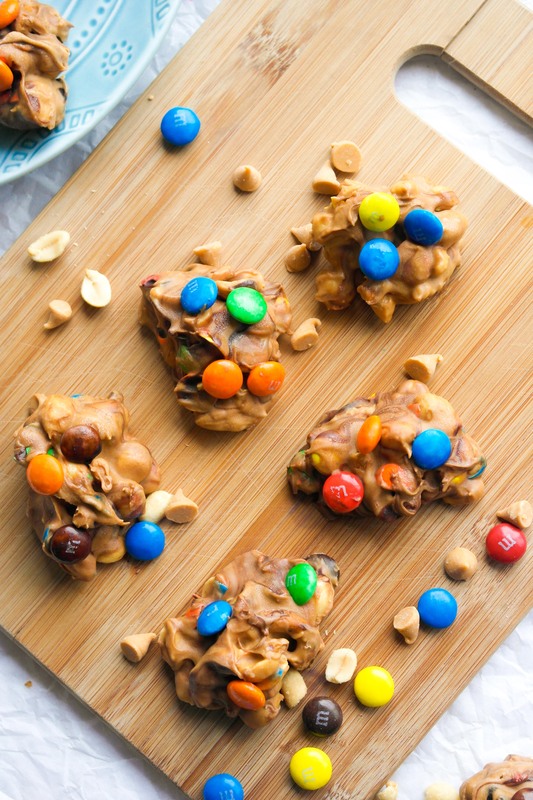 When the butterscotch chips are melted, add the peanut butter. When the two are completely incorporated, add the powdered sugar and stir. Finally, add the mix-ins. Then, scoop out the size you’d like for the clusters and put them onto the lined sheet. When you’re finished scooping them, put them into the freezer for thirty minutes. Then enjoy!